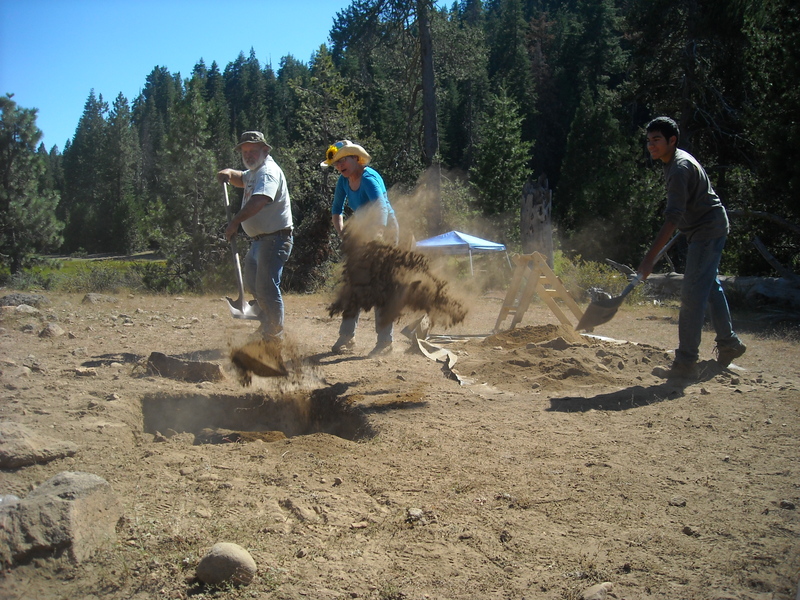 August 9-13, 2010 Lassen National Forest’s Lake Almanor District hosted its second Passport in Time (or PIT) project. 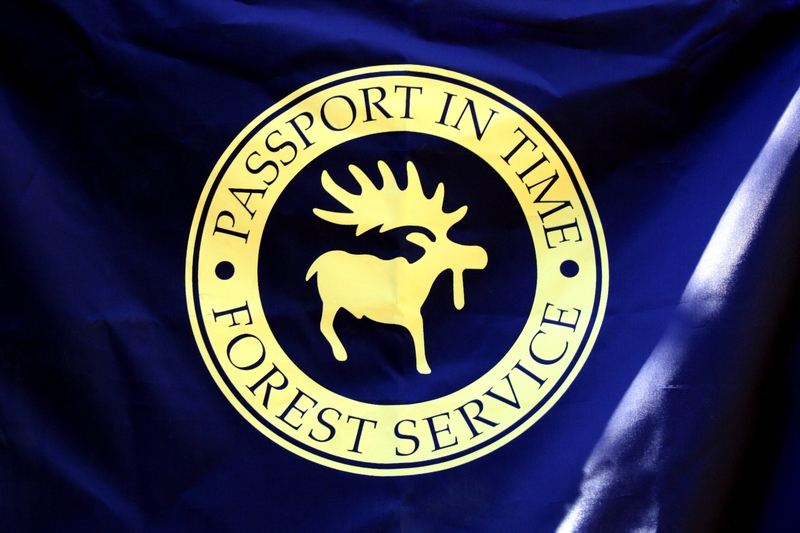 Passport in Time is a volunteer archaeology and historic preservation program of the USDA Forest Service. 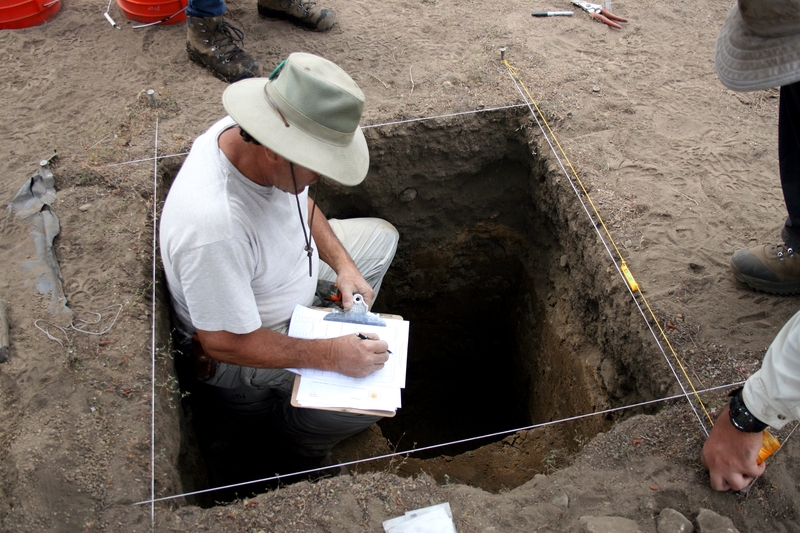 Throughout national forests in the United States, PIT volunteers work with professional Forest Service archaeologists and historians on a number of archaeological related activities. These activities can range anywhere from archaeological survey and excavation, to rock art restoration, site monitoring, archival research, historic structure restoration and even analysis and curation of artifacts. PIT volunteers receive a passport. Each time a volunteer visits a project, they receive a stamp and their hours are documented. Volunteers have the opportunity of collecting stamps (and experience) from projects all over the country. The goal of PIT is to preserve the nation’s past and share the excitement of archaeology with the public. PIT brings together people of all ages and experiences. It also provides FS archaeologists with “people power.” Our crew is normally limited to six individuals, but with the inclusion of over thirty additional people (including twenty volunteers and nearly a dozen archaeologists from nearby National Forests) we were able to work on a scale we could only dream of. Monday morning. The sun spills over the mountains, bathing the meadow in a warm, orange hue. People of all ages march single file towards a large barren mound in the center of the pasture. The sound of clanking shovels and plastic buckets draws the attention of a few free ranging cattle who call this small section of land beneath Mount Lassen home. The equipment is deposited in a pile, cups of coffee are finished off, sunscreen is applied vigorously in preparation for the day’s undertaking. Volunteers and Forest Service employees exchange names and handshakes. Work begins with a keen set of eyes and a good deal of walking. Surface survey, or pedestrian survey as it is often called, is the first step in the archaeological process. In this preliminary stage, archaeologists scour the surface of a site in search of cultural remains. 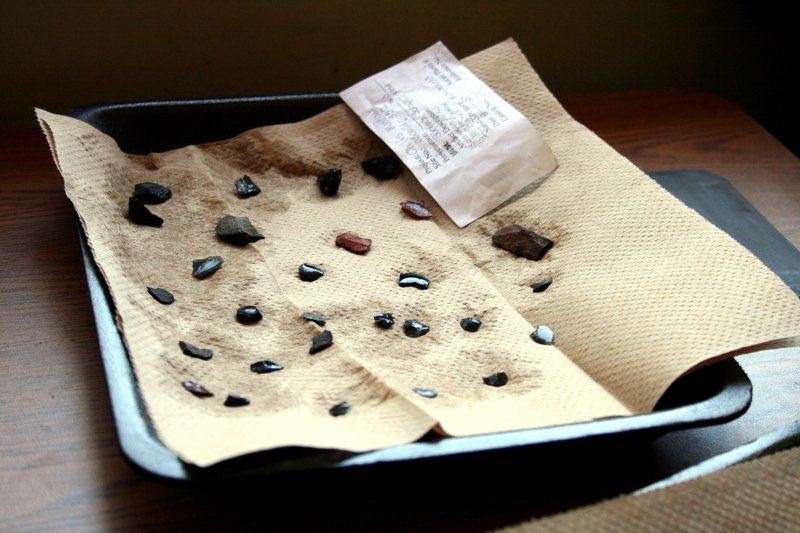 It is primarily this lithic debitage that these archaeologists seek; pieces of jet black obsidian or steel-gray basalt. Obsidian is of particular interest in that the stone is not available in the nearby area. The appearance of foreign materials is a good indicator of human activity, in this case tool making. There is also ground stone and a sizeable number of projectile points littered about. “Got it!” shouts Tim Van der Voort, a Forest Service archaeologist who is tasked with mapping the site. The volunteer holding the prism moves to the next flag which marks a broken basalt projectile point and the process is repeated. With over a hundred pieces of debitage flagged, it’s a job that requires an extreme amount of patience and precision from both individuals. All of the surface finds are recorded with the total station and then tagged and bagged for collection. Mapping the surface finds provides archaeologists with a sense of where concentrations of artifacts are located and where best to place excavation units on the site. The site is initially setup with six excavation units, widely dispersed around the mound to get the most representative sample. She pounds in the final nail, establishing a unit datum, or reference point, from which all of the measurements will be based. Only then can excavation can begin. Three forests have combined forces for this particular project; Lassen, Plumas and Mendocino, bringing together nearly a dozen Forest Service employees. This allows one archaeologist to work with two or three volunteers at each excavation unit. It is this close ratio of professionals to volunteers that contributes to such a rewarding experience. Thousands of cubic centimeters of soil begin making their way from the tip of a shovel to the bottom of a screen. Each person plays a part in the excavation process either digging, screening or recording data and the work alternates as the levels progress. It is dirty work. As the soil is shaken through the quarter-inch mesh, great plumes of dust take to the sky. It’s not long before everyone is covered in a fine layer of grime. “It’s terrible getting so dirty so quick, but it’s all part of the job,” a female volunteer admits. Within minutes flakes and projectile points begin to materialize in the screens. One unit even produces a mano, a type of handstone used in association with matates, or grinding slabs. 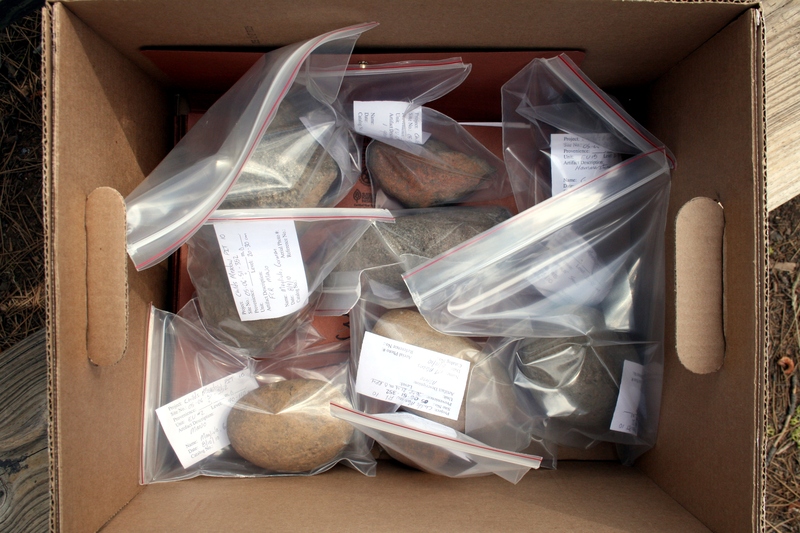 All of the artifacts are carefully bagged and will be taken back to the lab at the end of the day. Of course, some excavation units are more successful than others. My first unit on the furthest edge of the mound yields a measly 6 flakes in four levels. Meanwhile, units at the top of the mound are producing nearly two hundred flakes per level! Still I stay positive, it’s only the first day. “Even when you are not finding anything, you are still learning something about the site,” says an observant first-time volunteer. It’s true that less productive units help archeologists understand where activities were and were not occurring on the mound. It’s hard work, but it is good work and everyone is happy to be there. I can’t help but smile as the first day draws to a close and the crew boss shouts for us to pack it up. Eight hours of hard work and everyone is still smiling. It’s a satisfying sight and has me anxious to see what tomorrow will bring. Across the mound, work continues through the middle of the week. The tinny echo of trowels on soil and the gentle swish swish of pebbles across screens serve as the soundtrack to this vocation. Most archaeologists would agree that excavation is the most exciting part of their job. Finding “stuff” is what archaeology is all about. Here, volunteers take turns peeling back layers of soil 10 centimeters at a time. At their disposal are trowels, shovels, picks, dust pans, and brooms. Some of the volunteers have even brought their own kits. While some dig, others sit hunched over clipboards. 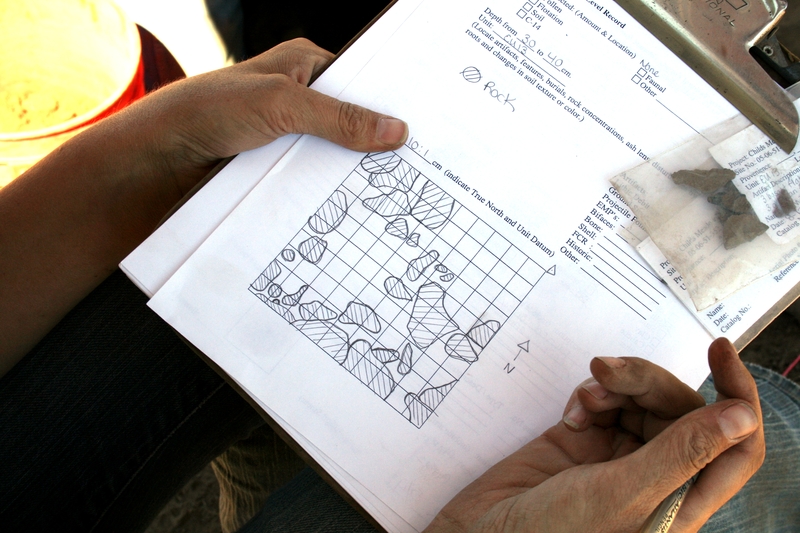 Field notes are also a crucial part of the excavation process. Artifacts tell part of the story, but it is the soil itself that completes the narrative. Charcoal flecks, black stains and fire cracked rock may be evidence of a hearth. Tiny shell fragments can indicate a midden. Even the size and color of the soil grains can paint a picture of the past environment. An archeologist must wield a careful eye and be constantly searching for change within the matrix of their unit. Excavation Unit #7 is drawing to a close. Crouched in the 90 centimeter deep hole, Forest Service archaeologist, Erin Bucher, gently sweeps the floor, preparing it for the final few steps of the process. The bottom of each level is carefully sketched on to the level form, providing archaeologists with critical details; soil features, ground stains, rock and root inclusions, changes in soil type. Pictures are taken and a Munsell chart is used to accurately identify the color of the soil. Then the crews begin the tedious work of returning all of the stone and soil from whence it came. The small plastic bags of artifacts are gathered up. Some units yield hundreds of flakes over the course of the excavation. All of these discoveries are transported back to the field lab where they will be cleaned and sorted. He has a point. As the sun dips west, it is hard not to enjoy the pleasant breeze and the beautiful scenery around us. It will be weeks before our crew can take a look at the abundant amounts of data that have been collected and form a more solid interpretation. In the meantime, Tim’s interpretation works just fine. Pocket-sized plastic bags cover the workbench from end to end. Each one contains a handful of grubby stone flakes. These are the spoils of our toil. Tucked away in the towering pines of a nearby campground is the PIT project field lab. Here volunteers scrub the finds diligently with specially pruned toothbrushes and pans of water. This is the time for archaeologists to eliminate anything that is not culturally relevant, “About 5% of what is collected in the field ends up being discarded,” says archaeologist and field lab supervisor Madeline Ware. It’s better for volunteers to err with the side of caution and collect something questionable rather than miss collecting something relevant. The countless trays of lithic debitage are left to dry before being transferred to clean artifact bags for curation. Later, they’ll be taken back to the lab at the Almanor Ranger District for further study. What can these artifacts tell us about the site and the people who spent time here? 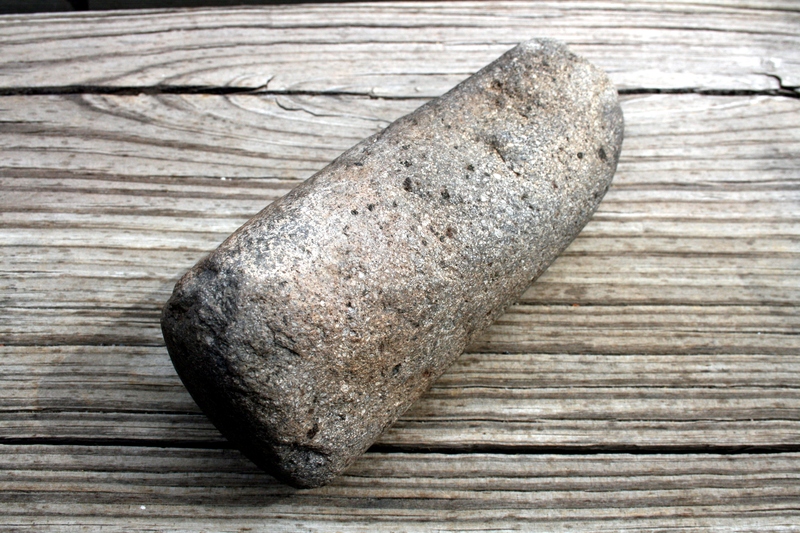 Objects like this mano, for example, will provide clues to the different types of activities that were taking place at this site thousands of years ago. 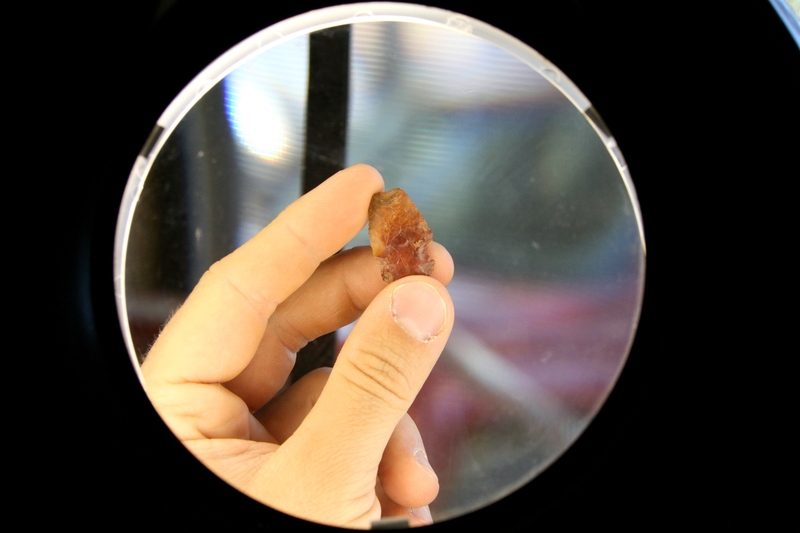 The styles of the projectile points and the materials from which they are manufactured can provide insight as to who these people were and where they came from. Even observations of the subsurface strata can provide clues about the ecosystem and the paleoenvironment of the mound. Information is everywhere, for archaeologists it is just a matter of interpreting it. Back at the site, it is the final few hours of the dig. Despite five days of arduous digging, spirits are still high. By now everyone is well versed in all the different roles of excavation. Paperwork is taken with meticulous detail, unit walls are cut with exacting precision; the PIT project has become a well-oiled archaeological machine churning out fourteen excavation units in just a few short days. The site has welcomed visits from a variety of individuals: local land owners, law enforcement, Forest Service employees, and curious passersby all interested to learn about the work at the mound. The project has recapitulated the broad appeal of archaeology. People love finding things in the ground. The PIT has also highlighted the importance of public involvement in the field of archaeology. So much of today’s archaeology,especially CRM, relies on public funding. Keeping the public interested in what we do is part of our job and it helps to ensure that those jobs will continue to receive funding. The PIT project goes one step further by actually involving the public in the physical aspect of archaeology. So do we. The volunteers have provided more help to the Almanor crew than they could ever know. What was undertaken in five days would have taken over a month with our six person crew. 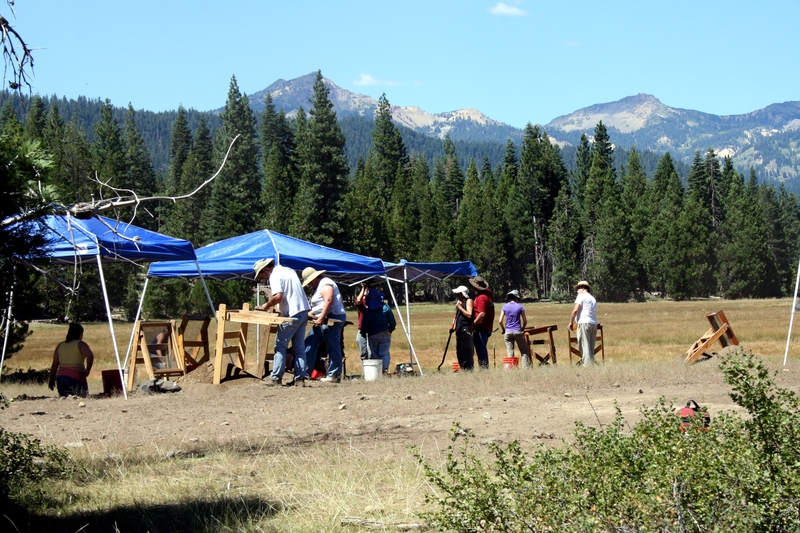 The 2010 Lassen Pit Project drawing to a close. It’s a bittersweet day. The past week has produced excellent data, happy memories and new friendships, but people are anxious for a shower and the comforts of home. 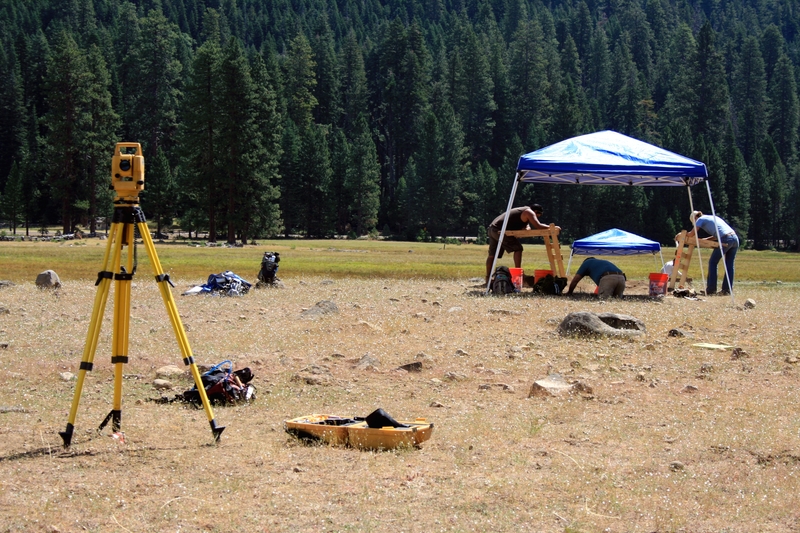 Over the next few months the data that has been collected will be carefully studied by the Almanor archaeology crew. 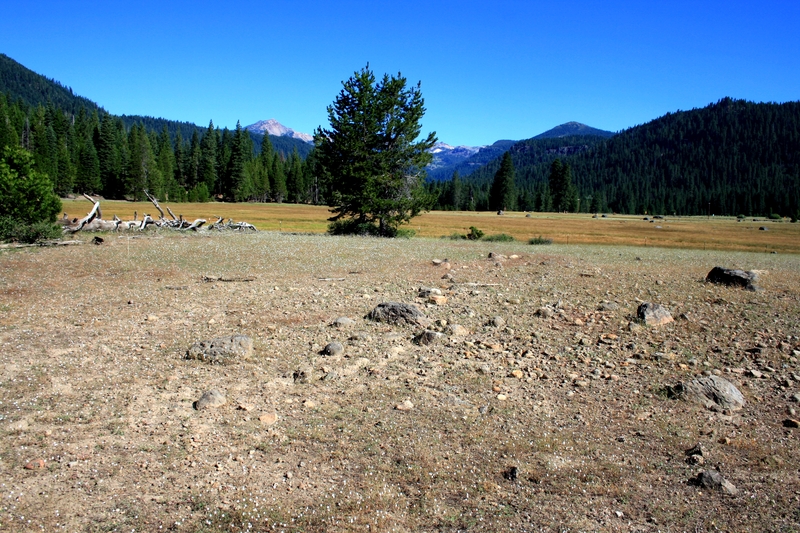 A more thorough understanding of the mound site will begin to emerge, which in turn will contribute to a more detailed vision of Lassen Forest’s prehistory. If you are interested in learning more about the Passport in Time program, visit the official website. There you’ll find information on past and future PIT projects as well as an application to apply. Most of the PIT projects have wrapped for the year, but 2011 promises to bring a whole new variety of volunteer opportunities. 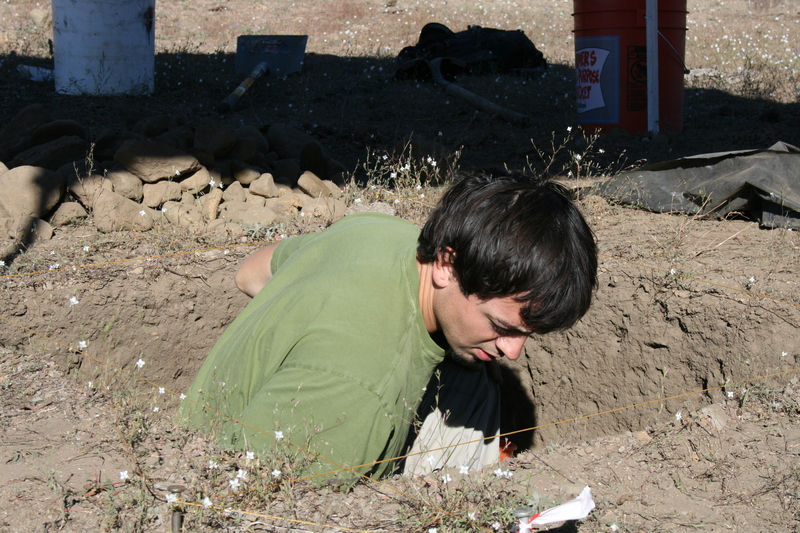 More pictures of the 2010 Lassen PIT project are available on Flickr.